The first of four sport Pacific halibut seasons off of California will come to a close after today, June 15. So far, the halibut fishing has been spectacular out of Eureka and Trinidad. The North Coast has always been known for its salmon, but it’s quickly becoming a halibut mecca as well. The first season, which opened on May 1, saw plenty of sport and charter boats alike haul in their limit of one fish per angler. It’s not uncommon to go out and catch a few, but to put five or six on board is pretty special. But now it’s time shift our focus over to rockfish and give the halibut a two-week breather. The season will re-open on July 1 and remain open through July 15. The remainder of the seasons open dates are: Aug. 1-15 and Sept. 1-Oct. 31, or until the quota is reached, whichever is earlier. CDFW has projected 6,490 net pounds of the 34,580 pound quota of Pacific Halibut has been harvested as of June 11.View the latest catch projection information. Also, check out the information about the seasons and regulations. The ocean is forecasted to get a little more wind this weekend, but may remain fishable. Out 10 nautical miles north of Cape Mendocino, Friday’s forecast is calling for winds out of the W up to 5 knots with W waves 7 feet at 11 seconds. Winds will increase on Saturday, and the forecast is calling for 10 to 20 knots out of the N and W waves 7 feet at 10 seconds. On Sunday, N winds are predicted to be 10 to 20 knots, with waves N 7 feet at 9 seconds. These conditions can and will change by the weekend. For up-to-date weather forecast, visit weather.gov/eureka/. You can also call the National Weather Service at (707) 443-7062 or the office on Woodley Island at (707) 443-6484. The California Department of Public Health (CDPH) lifted health advisories on June 2 related to certain sport-harvested bivalve shellfish in Del Norte and Marin counties. For Del Norte County, the advisory is being lifted for whole scallops and clam species other than razor clams. For Marin County, the advisory is being lifted for whole scallops and all clams. The health advisories were issued due to elevated levels of paralytic shellfish poisoning (PSP) toxins. Recent tests show that PSP toxins have decreased to safe or undetectable levels. There have been no reported illnesses associated with these PSP events. The CDPH warning against eating sport-harvested razor clams from Del Norte and Humboldt counties due to dangerous levels of another toxin, domoic acid, remains in effect, as does the statewide annual quarantine on sport-harvested mussels. The California Fish and Game Commission invites interested stakeholders to join a discussion to explore what may contribute to resiliency and long-term prosperity of fishing communities in northern California. The discussion is part of an ongoing dialogue to help clarify common concerns throughout the state, and help inform future Commission discussion or action. The meeting will be held on June 21 from 3:00 p.m. to 6 p.m. at the Howonquet Hall Community Center, 101 Indian Ct., in Smith River, CA. For more information about the Commission, visit fgc.ca.gov. The 43rd annual Kid’s Fish Lake Fishing Derby is taking place on Saturday, June 24 in Orleans. The derby starts promptly at 8 a.m. and runs until noon. It’s open to kids from Pre-K to the 8th grade. Poles and tackle will not be provided and an adult must accompany all children. Hot dogs and lemonade will be provided; adults are encouraged to bring a side dish or salad to share. The Orleans Rod and Gun Club, Orleans Ranger District, Coast Central Credit Union, CA Deer Assoc., Pacific Outfitters, AmeriCorps Watershed Stewards, and Our River Community host the event. For more information, contact LeRoy Cyr at (530) 627-3262. “Up until Tuesday, conditions on the halibut grounds were about perfect,” said Tim Klassen of Reel Steel Sport Fishing. “Conditions definitely changed, the surface water temps went from 52 to 56 degrees, and there isn’t the sign of life that has been there since the season opened. It looks like some new water pushed in from somewhere, probably a good time for the season to close. But it’s been a great season so far. More bait is showing up in the bay, and a few more keeper California halibut are being caught. There are still lots of shorts, about a third are keeper size,” said Klassen. 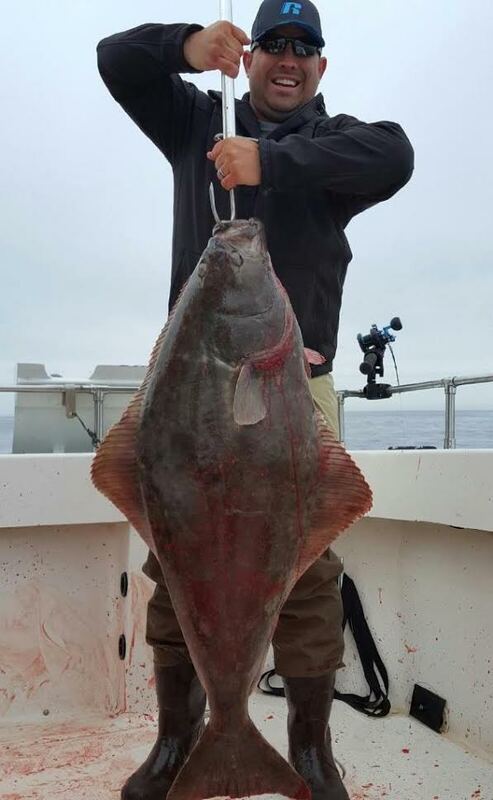 With so many undersized California halibut currently in the bay, it’s a good practice not to bring the fish in the boat if you don’t have too. Releasing the fish on the side of the boat is the best option. If you do net a “shaker”, be sure and use a soft, rubberized net with the smallest mesh available to avoid splitting the tail. Tail splits, if not severe, will heal, but will make the fish susceptible to fin rot. California halibut must be a minimum of 22 inches in length and the bag and possession limit is three. Halibut fishing has been pretty good this past week according to Curt Wilson of Wind Rose Charters out of Trinidad. He said, “There are a few boats that fish regularly that do really well. The rockfish bite, at least for black rockfish, is wide-open from Redding Rock to Patrick’s Point. We’re catching a handful of vermillion, coppers, and cabezon, but the majority have been blacks. There are also a few nice lings around, but it isn’t on fire,” Wilson said. The halibut bite was pretty good on Wednesday according to Leonard Carter of Crescent City’s Englund Marine. “I didn’t hear where the guys were fishing, but sounds like a few were caught. The rockfish action has been really good at all the usual spots when the boats have been able to get out. And the perch are still biting at both Kellogg and South beaches,” Carter added. Last weekend’s rain definitely kick-started the spring salmon run as the fishing was the best it’s been this season. The boat pressure is sporadic, but most are getting a chance at one to three fish per trip. The fishing should continue to improve through the month.